Empirical studies investigating the antecedents of positive word of mouth (WOM) typically focus on the direct effects of consumers’ satisfaction and dissatisfaction with previous purchasing experiences. The authors develop and test a more comprehensive model of the antecedents of positive. WOM (both intentions and behaviors), including consumer identification and commitment. Specifically, they hypothesize and test commitment as a mediator and moderator of satisfaction on positive WOM and commitment as a mediator of identification on WOM. Using data obtained from customers of a retailer offering both products and services, they find support for all hypothesized relationships with WOM intentions and/or WOM behaviors as the dependent variable. 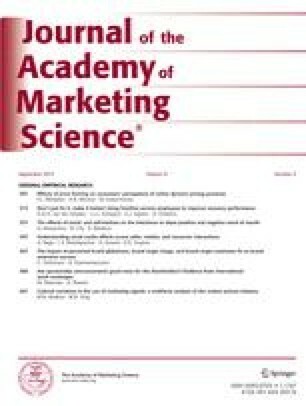 The authors conclude with a discussion of their findings and implications for both marketing theory and practice. Tom J. Brown (tomb@okstate.edu) is Ardmore Professor of Business Administration and an associate professor of marketing at Oklahoma State University. He received his Ph.D. from the University of Wisconsin-Madison. His articles have appeared in leading marketing journals including theJournal of Marketing Research, theJournal of Marketing, theJournal of Consumer Research, and theJournal of the Academy of Marketing Science. His current research interests include causes and effects of corporate reputation and the customer orientation of service workers. He is cofounder of the Corporate Identity/Associations Research Group. Teaching interests include marketing research, services marketing, and corporate communications. He is coauthor (with Gilbert A. Churchill Jr.) ofBasic Marketing Research (5th ed.). Thomas E. Barry (tbarry@mail.smu.edu) is a professor of marketing and vice president for executive affairs at Southern Methodist University in Dallas, Texas. He received his Ph.D. from the University of North Texas. His primary teaching and research interests are in the areas of integrated marketing communications, marketing management, brand equity, loyalty, and advertising effectiveness. His research has appeared in numerous journals including theJournal of Marketing Research, theJournal of Advertising Research, theJournal of Advertising, theJournal of Consumer Psychology, and theJournal of the Academy of Marketing Science. He is the author or coauthor of two books in marketing and advertising management. He has consulted for a variety of firms and is a director on four boards. In 1995, he received the Outstanding Contributions in Advertising Research Award from the American Academy of Advertising. Peter A. Dacin (pdacin@business.queens.ca) is a professor of marketing at Queen’s University in Kingston, Ontario, Canada. He received his Ph.D. from the University of Toronto. His primary teaching and research interests lie in consumer/managerial judgment formation, brand equity/dilution, corporate reputation, and research methods and design. He has also published in the area of sales force management. His research has appeared in several leading journals including theJournal of Marketing, theJournal of Marketing Research, and theJournal of Consumer Research. In addition, he has published in numerous conference proceedings. He is currently the chair of the American Marketing Association’s ConsumerBehavior Special Interest Group, serves on the Academic Council of the American Marketing Association, and is cofounder of the Corporate Identity/Associations Research Group. Richard F. Gunst (rgunst@mail.smu.edu) is a professor and chair of the Department of Statistical Science at Southern Methodist University (SMU) in Dallas, Texas. He received his Ph.D. from SMU. His primary teaching and research interests are in the areas of linear and nonlinear modeling and regression analysis, with an emphasis on spatial statistical modeling. He has co-authored three books on regression analysis and the statistical design and analysis of experiments, in addition to publishing scholarly articles in theJournal of the American Statistical Association, Biometrika, Biometrics, andTechnometrics. He has received the W. J. Youden (1974, 1985) and Frank Wilcoxon (1994) Publication Awards fromTechnometrics, and the American Statistical Association’s Award for Outstanding Statistical Application Award (1994). He is a fellow of the American Statistical Association and received its Founders Award in 1999.